Code-switching – the alternation between two or more languages, dialects or styles – is a well studied phenomenon, one that is found pretty much in every corner of the globe (Gardner-Chloros, 2009). It’s perhaps not surprising, then, that it also crops up in the media – in books, in film and in music – and not only in places where speaking two languages is the norm. And, just as in real life, code-switching can be used as a means to a wide variety of artistic ends. Below are some of my favourite examples from literature, pop music, and cinema. First of all, what about the written word? Code-switching in literature has not yet been the subject of much research, although there have been recent efforts to change that. But in fact, on the printed page, it’s not uncommon for authors to borrow words from other languages – for example, to add a sense of the exotic or a particular foreign place. Here code-switching, to and from the classical tongue, is a clever device to show Holofernes’ academic pedigree – and, more importantly perhaps, his desire to remind people of it. According to the translator of the passage, Robert Chandler, one of Pushkin’s great achievements as a writer ‘to make use of every possibility available to him: colloquial Russian, Church Slavonic and borrowings from French, German and English’ (Chandler, 2005). In discussing the evolution of Russian literature in general, Chandler goes on to argue that the greatest literature arises from ‘marriages – or battles – between different cultures’. 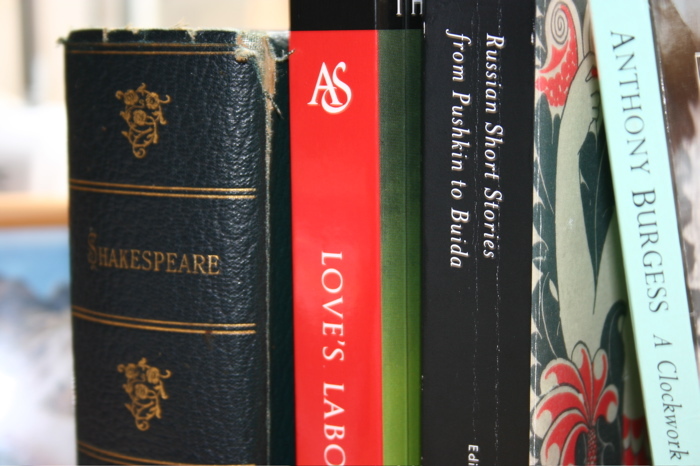 In other words, just as Shakespeare borrowed from Latin, French and Italian, and so on, so did Pushkin, Dostoyevsky and others to forge a new Russian literary language in the 19th Century. Code-switching was the linguistic means to do just that. Code-switching in film is also not a recent phenomenon. Bollywood is perhaps the classic example, where Hindi/Punjabi-English has been common practice for a long time (Sailaja, 2011). However, now even some Hollywood directors, such as Mel Gibson, are doing it (Barnes, 2012). In the cinema, code-switching can serve the same purpose as in literature – to give a sense of the foreign or the alien (take Stanley Kubrick’s adaptation of ‘A Clockwork Orange’, for example). But, on screen, code-switching can also be used more-directly to present a genuine linguistic reality. Because of the possibility of subtitles, if you want to render code-switching as a genuine reflection of the speech community in which the film is set, you can just get the actors to code-switch and translate in words the bits the audience won’t understand. An obvious example is the internationally acclaimed ‘Monsoon Wedding’ from 2001. Would the movie have been quite so rich and sumptuous, I wonder, if it weren’t for the constant code-switching between languages? But, probably my favourite film to feature code-switching, because it so neatly captures my own time as a foreign student abroad, is ‘L’Auberge Espagnole’. The film’s characters – all Erasmus students from across Europe thrown together for a year in a run-down apartment in Barcelona – constantly alternate between French, Spanish and English. If you exchange Spanish for German and Swiss-German (I was living in the Swiss city of Lausanne) that’s pretty much my experience too. Finally, what about code-switching in popular music? In the pop charts of the English speaking world, foreign language music is perhaps as rare as clothes in a Rihanna video – much to the chagrin of high school teachers looking to enthuse their students about learning languages. However, a sprinkling of a foreign language in an otherwise Anglophone record can arguably help it stand out from the crowd. As a result, in the competitive world of the Billboard charts, a degree of code-switching is more common than you might think. Of course, code-switching is not limited to the British and American charts. Elsewhere, it’s arguably more prevalent. For example, outside of the Anglophone pop world, a sprinkling of English can give the song a more international or Western flavour. Barnes, L. (2012) The role of code-switching in the creation of an outsider identity in the bilingual film. Communicatio: South African Journal for Communication Theory and Research, 38, 247-260. Sailaja, P. (2011) Hinglish: code-switching in Indian English. ELT Journal, 65, 473-480. National Public Radio (NPR) has just started a fascinating blog about code-switching, which is well worth checking out. This entry was posted in Uncategorized and tagged bilingual, creativity, language, linguistics, words. Bookmark the permalink. These are just a few examples that I picked out – I’d love to hear your favourite examples of books, films or songs that use code-switching. The other subtext of Holofernes’s style is that he’s an ignoramus. Debt and doubt are from Old French dette and doute, so they have never had /b/ in in English at all, and abominabilis is < ab omine (ablative of omen), not from ab + homine. For my favorite example, see “French In All Its Purity” on my blog, which contrasts code-switching with intensive borrowing. Nadsat-talk is really an example of the latter, because there is no Russian syntax. John, many thanks for the insight on Holofernes. My Latin (sadly) being close to zero, I’d twigged the ‘bumbling old fool’ side of Holofernes but not that Shakespeare makes it manifest in his Latin grammar. The ‘borrowing’ vs ‘code-switching’ issue is a very relevant point, which I was conscious of it when writing, so thanks for pointing it out. The research community do seem to be a bit divided on this when it comes to the definition of ‘code-switching’: certainly my Applied Linguistics professors tend to take a holistic view, because the focus is on the pragmatics and the social motivation. This approach also made more sense for a general blog on creativity, but perhaps wouldn’t for any one interested in the grammar of code-switching. When I saw at the top of the post that you were going to consider films, Jean Renoir’s La Grande Illusion came immediately to mind. It has, I’m sad to say, been many years since I saw it, but it seems to my memory that a couple of the officers (one of them played by Erich von Stroheim) did some code-switching. I think some of it was in casual conversation, and I vaguely recall von Stroheim shouting in English at an especially dramatic moment in the film. Don’t quote me on that, though: it’s been probably almost twenty years since I saw the film. I should have a look at that one again. I remember liking it. Thanks, Virgil. Glad it brought to mind the film – not one I know but will look it up. One of my professors (http://www.bbk.ac.uk/linguistics/our-staff/jean-marc-dewaele) has done quite a bit of work about emotional outbursts and code-switching to and from an individual’s first/second languages. Sounds like code switching in the film is very definitely art imitating life. Wow… That went over my head! But I do speak CATlish and mom speaks Chinlish. Does that count? I’m not much for Internet popularity contests, but, if there were a “Like” button or some voting mechanism, I’d give this comment high marks. But I’m biased. Got a love for cats. P.S., to our moderator: if you do see the film, I hope you enjoy it. As I said, I think it’s a good one, and it may well have a few linguistic things up your alley.